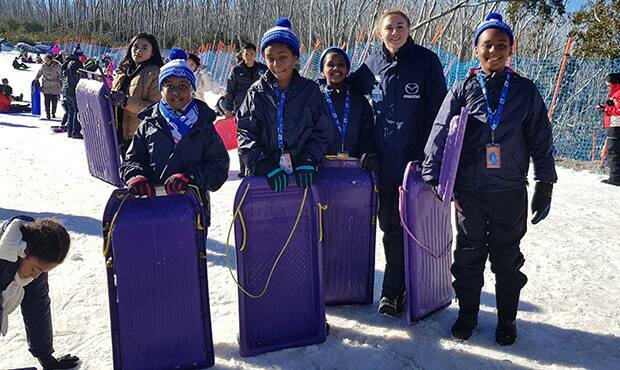 The smiles on their faces said it all; experiencing snow for the very first time clearly an experience that will be cherished for some time to come for more than 20 7-to-12-year-olds. “I was really excited, the snow was a more solid than I expected but it’s quiet nice,” participant Khadeeja Butler-Komba said of the snow. The Huddle’s school holiday program took the group on a special day trip to Lake Mountain Ski Resort and the reactions were priceless. “It was awesome being able to share this experience with them,” Community Sport & Recreation Coordinator Steph Webb said. Entertained by tobogganing, the 240m flying fox and snow tubing, the kids rotated through the activities, some even pushing themselves out of their comfort zones. “At first, some were hesitant about going on the flying fox but they were willing to give it a go to conquer their fears and felt proud of themselves after they did it,” Webb added. The participants came from local community centres and primary schools, with some previously included in the Hop on Sports, Active Boys and Active Girls programs. The Snow Day was one day of The Huddle’s July School Holiday programs. Designed to be fun, memorable and educational, children and their parents from North Melbourne visited Science Works, learnt to code and played in the snow at Lake Mountain. Young people in Wyndham strengthened their leadership skills and planned their careers through a range of activities including rock climbing, a visit to Melbourne Zoo, learning to pour the perfect brew as a barrister, getting CPR certified, and learning what it takes to be a leader on the sports field with North Melbourne Football Club’s Ed Vickers-Willis. These activities were made possible with thanks to the Scanlon Foundation and Victorian State Government Department of Education and Training. To find out more about The Huddle’s programs, click here.